Trainer Bob Baffert expects the real Coliseum to show up Sunday in the Grade 2 San Vicente Stakes for 3-year-olds at seven furlongs after disappointing as the odds-on favorite in last month's Sham Stakes (G3), finishing sixth. Such is life on the Triple Crown trail in February. 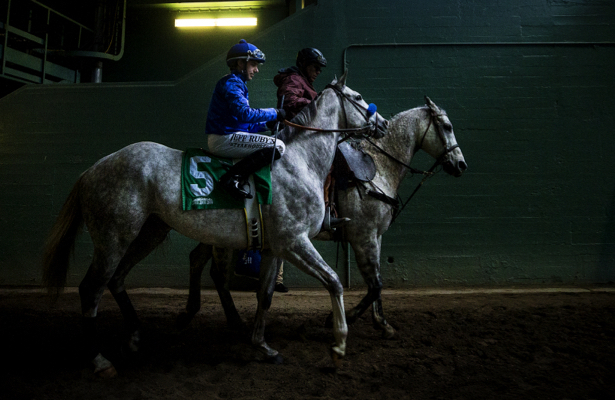 “He got off slow and got behind horses,” Baffert said of the Sham. “We tried rating him, and we're still trying to learn about the horse. Going long first time, you sort of have to be in the race. He got behind and wasn’t enjoying it. “His psyche was off, and he didn’t know what was going on. He didn’t get beat that far, but it wasn’t a real strong race, either. He’s come back and I’m trying some different things. Mike (Smith) has worked him a couple times but he’s still not breaking that well. Baffert also entered daylight debut winner Dessman in the race. The field for the San Vicente, which goes as race eight of nine: Synthesis, Kent Desormeaux, 6-1; Coliseum, Mike Smith, 6-5; Dessman, Flavien Prat, 5-2; Sparky Ville, Joel Rosario, 4-1;and Savagery, Heriberto Figueroa, 4-1. Two-time Kentucky Derby-winning jockey Mario Gutierrez has parted company with Tom Knust and hired Matt Nakatani as his new agent. Through 27 racing days at the Winter Meet, the 32-year-old Gutierrez had a 6 percent winning average with four firsts, 11 seconds and nine thirds from 64 mounts. “Mario just wanted to make a change and he hired Matt Nakatani, who’s a good kid,” Knust, anything but petulant, said Saturday morning. “I love Mario’s family and all I can do is wish him the best of luck. Most recently, we were together over two years. We were together before that for about a year but parted and got back together again. Gutierrez also won the 2012 Kentucky Derby on I’ll Have Another, like Nyquist, owned by Mario’s principal patron J. Paul Reddam. FINISH LINES: Santa Anita morning line maker Jon White reports that Bob Baffert’s Ax Man, who won Friday’s seventh race, a seven furlong allowance by 1 ¼ lengths in 1:21.92, earned a lofty 97 Beyer Speed figure . . . Agent Joe Griffin is back in action at Santa Anita with Jose Leon, an apprentice who has been riding at Turf Paradise in Arizona. He is expected to start working horses here Thursday and begin riding competitively shortly thereafter.